You really don't know how much I love to throw on an old woolly jumper. The majority of my Summer clothes have now been packed away :( seen as though the weathers dropped dramatically.. it's been really cold these last couple of days in the UK. I much prefer Summer nights. Anyway I feel like this outfit seems to have a real 'witchy' vibe about it... now I don't no if it's the skirt or the hat or both of them put together? All I really need now is a cauldron! Just imagine how amazing it would be to make your own spells and potions?!?!? Ok let me just get back to the real world ha! I'm forever distracting myself aren't I? So, I've been really into my hats these colder months don't you reckon? I've never got one off my head! I'm starting to think I'm Ne-Yo or somethaaang. 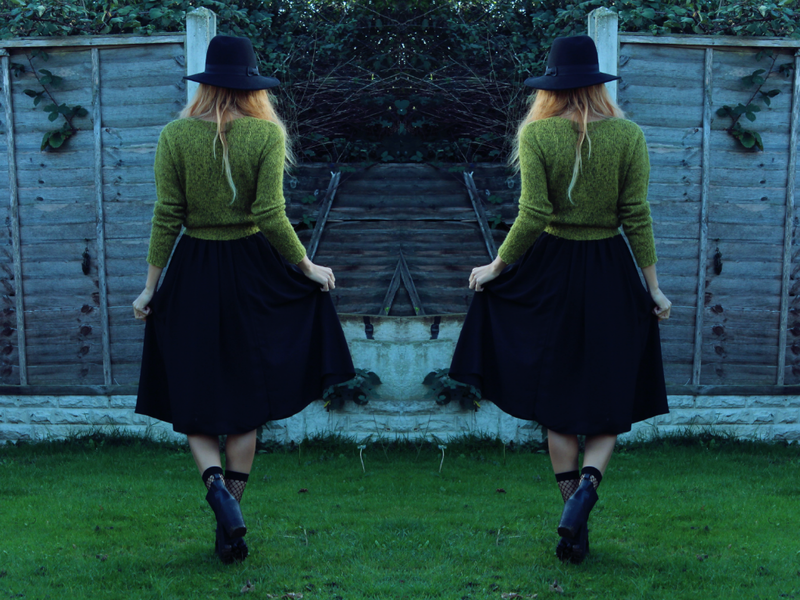 I think the skirt, hat, socks and boots give an old jumper that new/edgy look you may just be after. As whenever I wear a jumper and leggings or a jumper and jeans I just feel like too much of a plain Jane, not that there's anything wrong with it. I just like a little extra something... maybe some would say I'm OTT. I really can't believe Bonfire night is over with... It's Christmas next! i best start shopping! eeeeeek. you look awesome, love your style! Witches are not meant to be hot! Pfft, how do you manage this?! Girl crushing as always!